Reader Liz emailed with a total dilemma - what to do when you're hosting a baby shower and the honoree is far from traditional? "[She's] very modern. No pastels, no neutrals... nothing traditional. ...she wants something bold and different". 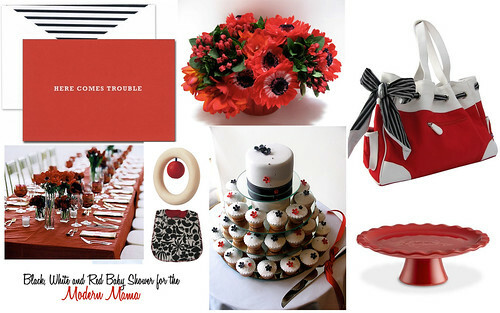 After a quick Q&A session, we decided that a palate of red and black with touches of white would be perfect for a stylish shower for a modern mama! Liz, I hope this helps! Party predicament? Wedding worries? Send an email or leave a comment and I'll do what I can!